It was another beautiful day with blue skies and sunshine. Michigan has had a tough decade with the collapse of the auto industry and the recent water crisis in Flint. There was a time when Michigan was the place to be with Motown, the big 3 automakers and the HQ of the two largest pizza companies, Dominos and Little Caesar's. Real estate could not keep up with demand as thousands of immigrants flocked to Michigan for opportunity. This prosperity can still be seen in the resort towns of Northern Michigan that hug the west coast. Lake Michigan, like all the Great Lakes, provides sandy beaches, clear blue water and beautiful sunsets. Petoskey is a good example with high end cottages, local boutiques and yachts and sailboats in the harbour. Similar to Lake Superior, Lake Michigan has a 'circle the lake tour'. The Lake Michigan Circle Tour is roughly 900 miles long and would take 14.5 hours with no stops. 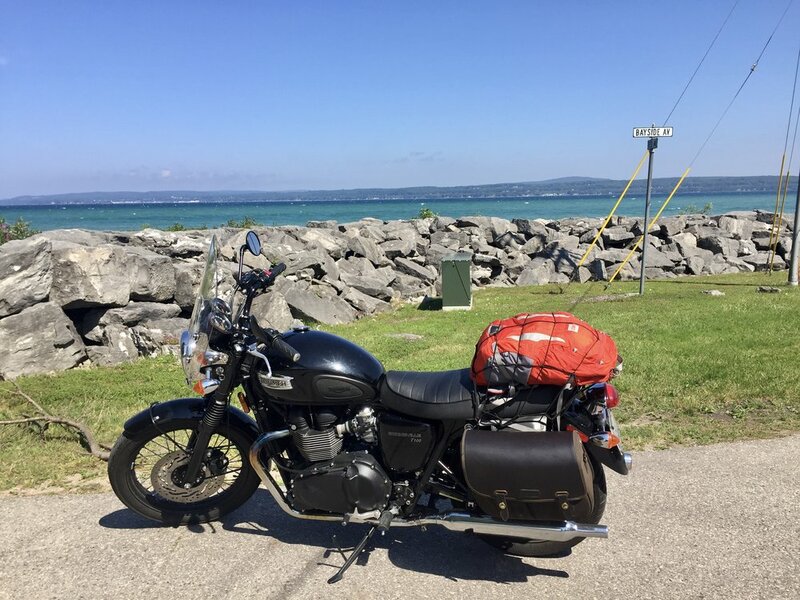 As I rode south down the west coast of Michigan I crossed the 45th parallel which is the halfway point between the North Pole and the Equator. This trip brought back a lot of what I studied in school and that education proved to be useful. Geography, geology, history and algebra. The USA still measures distance in miles but my speedometer and odometer only show km. I wasn't too worried about speed because I went about as fast as the cars around me. However I had been doing a lot of math in my head regarding distances (1 mile equals 1.6 kms). I could ride approximately 200 km on a tank of gas and I had developed a habit of getting gas sooner rather than later in order to minimize the risk of running out. So when the signs posted distances in miles I spent some time trying to calculate the optimum distance to stop for gas in kms. I rode south along the coast until Hwy 72 where I turned eastward toward Ontario. I followed the highway southeast to Flint and then it was a straight shot to the border. All the way through Michigan the landscape became more familiar with gentle rolling hills, farms and trees. Even the late afternoon light reminded me of Ontario as the sun cast shadows from the trees bordering the highway. I crossed the border into Canada at Sarnia. The border agent was friendly, welcomed me home and told me to ride safe. Traffic was light and it felt good to be back in Ontario. I stopped for gas in Strathroy and the gas attendant asked about my Triumph and told me about the one he had owned in the late 60's. It's a common theme. I stopped in St. Thomas for the night to visit with my parents. They were very happy to see me back safe and sound and even had a cake!